"So, What Would You Like to Know About the Shopping at Lake Garda?" The shopping at Lake Garda offers just about anything you could wish for. Whether you're looking for handbags, shoes, clothes, paintings, or just want to check out the local markets, there are so many things just crying out to be bought! If you are not in Lake Garda in the near future, but love Italian products, why not take a look at our Italian online shop. The nice things about the shops here is they are so individual!We'll tell you about the specialities that can be found when shopping at Lake Garda and give you some handy tips. The Italians love their clothes so we've even put together a clothing sizes conversion chart so you'll know what size you'll need! So...Ready for the Shopping at Lake Garda to be revealed? 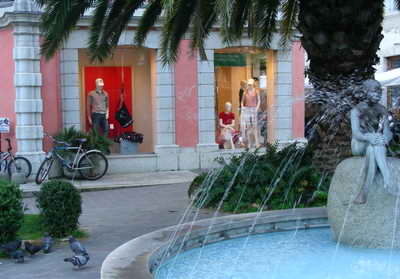 Handbags, shoes, belts, wallets, jackets...these items are found when shopping at Lake Garda. If you really shop around, you can pick up some real bargains too! The prices for leather goods are very competitive between the stores, and you can also barter with the shop-keepers. You only need to know one italian word for bartering, and that's 'Sconto? ', meaning 'discount? '...this often works and is worth trying! You probably already know that Italy is the centre of the fashion world. The clothes you see in the shops around Lake Garda reflect that...they are all the latest and greatest styles! If you're looking for the top Italian desginer names like Versace, Gucci, Armani and Prada, then you definitely enjoy it here. Find out which towns are the best to go for the ultimate Lake Garda clothes shopping experience. You will see various paintings, art and crafts for sale in every town around Lake Garda. Most of the paintings are bright and full of color - reflecting the typical Meditteranean scenery. The artists usually use oil and somtimes acrylic for their medium. Watercolours are also seen quite a bit. One thing you'll notice is all of the street artists, it's fascinating to watch them at work and they sell their work for a very good price. Beautiful detailed pottery, marble and copper works are common as well. The towns around the Lake each have a weekly market. They are great fun and well worth going to for the incredible selection of clothing, food and items...all at fantastic deals. We'll tell you here what day of the week each town has its market. Oh, and don't forget to do LOTS of bartering there, it's expected! The only question you need to ask is 'Sconto?' which means 'Discount? '...so remember that one italian word! Discover more about the Lake Garda markets and which days they take place. If you're staying in a self-catering accommodation, there are lots of places around for food shopping. You'll be surprised how much cheaper the food is there, particularly the wine (we saw some once for only 50 cents!). The supermarkets offer a good selection of food, and most take credit cards, too. Their opening hours are normally the same as the local shops (see advice about Italy page). What is the best place to shop on Lake Garda? 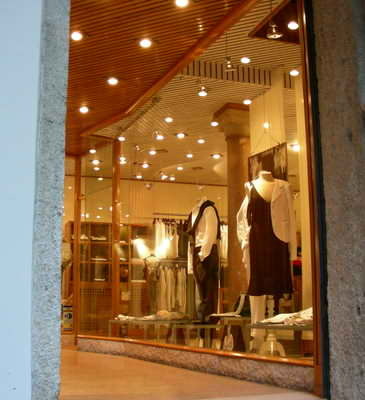 Have you had an awesome Lake Garda shopping experience? Well where was it and what was it like? Why not share your story about it and you are highly likely to get your own spot on our website! Your story could well feature on a dedicated web page and may even get in our newsletter too! How good would it feel to show your friends and family your own Lake Garda story on a well respected Lake Garda site! We love pictures as well, so feel free to send us your best shots and there will be no mistaking you then!